Kemar Roofe says that the travelling Leeds United fans inspired the Whites to claim a late draw away at Middlesbrough. It looked as if the Whites would suffer a sixth defeat in eight games as the clock ticked down at the Riverside Stadium, but during a mammoth amount of time added on, Kalvin Phillips popped up with the equaliser. Despite dropping two points in the north east, Leeds still went back top of the Championship table and Roofe insists the fans inspired the team to never give up against Middlesbrough. He posted a photograph of the travelling fans on social media and wrote: "We refuse to give up with this kind of support behind us." Despite claiming a come-from-behind point, the pressure will be on Leeds to beat Swansea City in their next Championship encounter, at Elland Road. 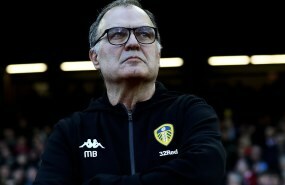 Marcelo Bielsa's side then travel to the capital to lock horns with QPR, before their final game of February is at home against Bolton Wanderers. Leeds are 17th in the Championship form table over the last six games, having taken seven points, with a record of two wins, one draw and three defeats.